I don't know if I've mentioned this before or not but I love classical and instrumental music. Well, I love most any type of music but those are my absolute favoritse. I love how they can convey so many different emotions without words - the music alone can make you feel so many different things. And there's so many different types of songs - some are more contemporary while others were written a very long time ago, some were themes in movies or on television shows, others you may have heard in passing but never realized what it was. 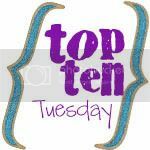 So for today's Top Ten Tuesday, I'm talking about my Ten Favorite Classical/Instrumental Songs. This post is very video heavy so I put it all behind a jump break! Wow. Great list---I'm not a classical music junkie so thanks for the suggestions! I LOVE classical music. It really calms and relaxes me! Thanks for sharing your list and for joining in the Hop!